And not with your hair. I'm pretty lazy but I always make sure I clear my hair from the shower drain, just because you know it's not that nice showering and your feet touching some floating hair as the shower tray fills up because the water can't drain properly. If you've never encountered this problem then I hope you never have too. In our house I was normally the one who ended up clearing the hair from the drain. And yes that does mean I used my hands to fish it out. There's only so much hinting about the problem one can do. Girls are just as messy as boys. In fact, our kitchen didn't become tidier when there was just girls it was the exact same as when we shared with boys. I think we all got to the point where we'd rather just do our dishes the next day. None of us were particularly fussy about washing up so everyone just got on with theirs when they wanted too. We're probably a bit of an anomale as you see and hear so many people complaining that they have a gross flat mate who never does their washing up, well in our house this was most of us. Especially in exam season. I mean it's an all girls house. People have boyfriends, people bring boys back. It's all fine. But it is a little awkward when you're not expecting to see any boys and are wandering around in your underwear. In fact, you'll just meet random people full stop. You'll walk into the kitchen and find a group of your housemates friends who you didn't know existed having pre drinks and helping themselves to your best mugs (which you then rescue and hide because nobody is destroying your crazy cat lady mug). And no you don't all watch it together whilst eating your home baked treats either. I tried baking about three times and each was quite a fail. I mean, the cakes were edible and tasted fine but things always went a bit wrong. Apart from the time we made cookie dough. That was good. I guess, none of us enjoyed baking (or cooking for that matter). The house had had a group of girls beforehand and it seemed like they loved their baking, they left us some baking tins but we never used them. We would all rather just walk to Sainsbury's and buy something from the bakery there. 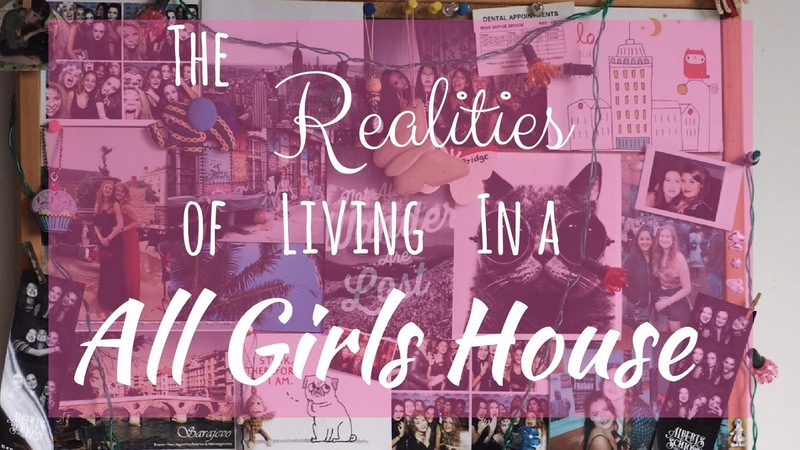 Obviously, these aren't the reality for every all girl house, these are just some things I have expereinced while living in one!